The Sustainable Sites initiative (SITES™) has selected four Seattle projects for the SITES two-year Pilot Project to promote sustainable land development and management practices. Projects include over 150 sites with and without buildings, in 34 US States, and Canada, Iceland, and Spain. Description: This project will transform a greyfield site in a residential neighborhood once home to a church, into a small local park which will include a community garden, a gathering plaza for community events, a skate-spot woven into seatwalls, and spaces for quiet introspection and children’s play. Community support for sustainability, articulated in several neighborhood workshops, will be implemented through material reuse and reclamation of road paving for rain gardens along the site’s street edge. Description: This park was designed and developed in collaboration with community volunteers. The result is a multi-functional, sustainable, accessible neighborhood park that includes community food gardens, organic gardening and ornamental, water-wise demonstration gardens, compost demonstration, a children’s A to Z garden, a seasonal wildlife pond and vegetated swale for on-site drainage, tractor play area, basketball court, native plant areas and a community gathering pavilion. Description: This greyfield project envisions sustainable site design in conjunction with the redevelopment of the PBS station’s existing 60,000-square foot building to Platinum level LEED–EB performance. Focus will be given to the building’s 32,000-square foot roof, half of which will be transformed into a food garden to exhibit urban horticulture. On-site energy generation and water collection will occur on the roof’s other half, all of which will be visible from the nearby Space Needle. Description: Theater Commons, a 1.6-acre site within a major urban park and cultural center, revitalizes an existing campus vehicle entry into a pedestrian-friendly, multi-functional, tree-lined street overlooking new gardens, terraces and seating areas between two professional theaters. The site integrates sustainable design and highlights ecological features, such as Cascadia native plants and innovative stormwater infiltration, as a prototype for future campus projects. There are seven additional projects in Washington state, including sites in Tacoma, Olympia, Fort Lewis, and Bremerton, among others. The Sustainable Sites Initiative is an joint effort by the American Society of Landscape Architects, the Lady Bird Johnson Wildflower Center at The University of Texas at Austin and the United States Botanic Garden to create voluntary national guidelines and performance benchmarks for sustainable land design, construction and maintenance practices. And don’t forget to help save Metblogs! The Northwest is a great place to live for many reasons. One of the most compelling is the stunning natural landscapes. The Puget Sound area alone offers endless opportunities for being awed by nature’s bounty – mountains, bodies of water, and lush, verdant flora. The National Parks Conservation Association wants to make sure that you know all about the opportunities available to you to go out into this beauty by hosting Northwest National Park Family Day this Sunday, May 2. From 10 am to 3 pm at Seattle’s Seward Park, national park rangers will be on hand to talk about our neighboring national parks, Mt. Rainier National Park, Olympic National Park, and North Cascades National Park Services Complex, which encompasses Ross Lake & Lake Chelan National Recreation Area. If you’ve never been to these parks, you’ve been missing out on chances for hiking, boating, bird watching, fishing, horseback riding, camping, backpacking, mountain climbing, bicycling, walking and just generally being out in nature. To prepare you for your future visits, National Park Family Day will offer hands-on demonstrations on how to build campfires, cook marshmallows (few things in life are as great as marshmallows toasted over a campfire), and be safe outdoors. Local outdoor equipment retailer REI is sponsoring sessions on “Hiking in the NW” and “Leave No Trace Camping”. San Juan Island Historical Park presents a banjo performance. Washington Trails Association presents a hike through Seward Park to get you warmed up for hikes in the national parks. Lewis & Clark National Historical Park presents “Lost But Safe & Sound” – useful information on keeping yourself from danger should you wander too far from the trail and the Olympic Park Institute/NatureBridge give a demonstration on Water Quality Testing. Campfire stories and songs help make a festive day and a variety of wildlife encounters will teach you about the many species of animals living in our state. Farmers market season is upon us and today we have the first of the seasonal Farmers Markets opening in Columbia City. The Columbia City Farmers Market runs from 3-7pm every Wednesday until October 20th. I admit, I was a little worried that Zoo Tunes would go the way of the Lake Union Fireworks show this year. After all, in past years they have been sponsored by the now defunct WaMu. But thanks to BECU, they are back again this year and the lineup was just announced last week. Tickets go on sale on May 3rd, at all Metropolitan Market locations. Individual artists may have tickets on sale already through fan sites, so if you are worried about a particular date selling out, check the band’s site now. Great Big Sea (one of my personal favorites) for example, just had a pre-sale of tickets for fans last week. Lineup after the jump. Some of my favorite childhood memories involve going clamming. What joy there is in crossing the beach in hot pursuit of the wily razor clam and what pleasure there is concluding the hunt with a clambake. Clams are quite fun to catch and even more fun to eat. The Washington State Department of Fish and Wildlife has given the go-ahead for some razor clam digging in November. Their season update approves digging at Twin Harbors November 14 – 17; Long Beach, Copalis and Mocrocks for November 14 – 15; and Kalaloch Beach for Monday, November 16 only. Additional dates have been tentatively scheduled through January. It is important to always verify the approved dates for clamming before you go out. If you do decide to go clamming–and really, you should, it really is quite fun–you might want to take advantage of the special deal being offered by the Kalaloch Lodge in the Olympic National Park. Their Clam Digger Lodging Package offers clam diggers at all levels from first-timers to old hands a night of lodging in their beautiful facility conveniently located near to the beach plus breakfast in the morning. It’s available Monday, November 16, and is tentatively scheduled for Friday, December 4, Saturday, December 5, Thursday, December 31 and Friday, January 1, subject to approval from the Washington and National Park Services. Newbie clammers can book a room using the code CLAMDIGNEW for a package that starts at $169 and includes a night at the lodge, a bucket, shovel and net and breakfast for two the next morning. Clam diggers who already have their own tools can use the code CLAMDIGPRO for a package that starts at $129 and includes the room and breakfast. Guests can stay additional nights for just $99 a night, an excellent deal. Besides clamming there are all kinds of things to do and see in the Olympic NP which contains beaches, rain forest valleys, mountain peaks and far, far more different types of plants and animals than you can name. It’s one of the most beautiful places in our state, and, honestly, maybe in the whole world. To learn more about the Kalaloch Lodge or to book your clamming experience, visit their website. (Even if you’ve decided that clamming is just not for you, it’s an excellent vacation spot and the lodge offers a bunch of great package deals aimed at a variety of interests.) To learn more about the Olympic National Park, visit theirs. All the information you need to know about clamming in Washington (including how to clean and cook the tasty things) can be found in the Razor Clam section of their website. Some basics: a license is required for any digger 15 years or older. Any 2009 annual shellfish/seaweed license or combination fishing license is still valid or you can get a razor-clam only license available in annual or three-day only versions. Buy a license online, by phone at 866.246.9453 or in person at any of the more than 600 authorized license vendors. ALWAYS check the weather and surf conditions before heading down to the beach so that you know what you’re facing and, seriously, don’t be stupid about the ocean. It may be a beautiful source of bounty but “killer waves” is a literal expression sometimes. Now that fall has come, some of the farmers markets in our area will start to shut down. The first of those to go is going to be the new Queen Anne Farmers Market. The Queen Anne Farmers Market broke off from the Seattle Markets organization (who runs the Ballard, Wallingford, Madrona, and Fremont markets) and started their own, independent, non-profit market. They are really a plucky little organization, having started from the ground up late last fall and they’ve put on a consistently busy and decidedly Queen Anne type of market all summer long. Go check them out during their last two weeks. Skillet is there serving dinner, and there’s Parfait Ice Cream as well. They always have music and their chef demos have been impressive and tasty every week. I have to admit to being somebody who rarely considers the Eastside of our Metro Area when it comes to planning social engagements and local excursions. Like many, I tend to think of it more as a hub for commerce and fine dining than I do as someplace I’d want to spend my weekend. As I recently discovered, the best part of such misconceptions is how easily they’re replaced once the reality of a situation becomes clear. Last week I was given the opportunity to take part in the “Camp Woodmark” experience at The Woodmark Hotel, Yacht Club & Spa in Kirkland, which just so happens to be the only hotel located on the shores of Lake Washington. Camp Woodmark was designed with adults in mind, meaning they offer a grown-up kind of fun without any of the awkward moments or pre-teen angst from the summer camps of our youth. Upon my arrival at The Woodmark I was cordially greeted by Brandon, one of the “camp counselors” entrusted with making each campers stay as relaxing and hassle-free as possible, who presented me with a welcome package that included several Woodmark t-shirts and reusable aluminum water bottles. Not long after that I was on the balcony of my amazing fourth floor lakeside room, enjoying a cool breeze and feeling that there may just be some merit to escaping into your own city after all. My friends have been flocking to the beaches to beat the heat. I’ve been envious of their nighttime frolicking, but am too terrified of flesh-eating bacteria and toxic water to make the trek to meet them, let alone set foot in the toxic muck. To counter my fears, a friend directed me this map and informed me that — counterintuitively — the water at Green Lake is cleaner than that in Lake Washington. I’m not sure that I can get over my lakey superstitions, but maybe this evidence will help you jump in. For the colder, and somehow less scary, salt water beaches, you can check the Washington State Department of Health; here’s King County, looking “good” [doh]. Go fishing! We are fortunate to have a ton of rivers in the region. 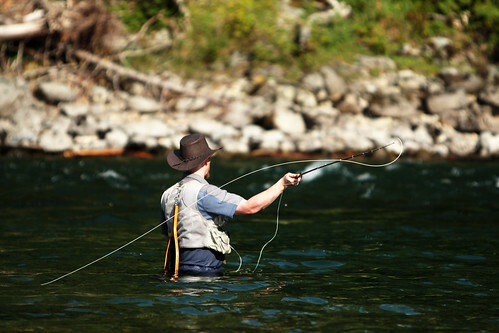 Here, my husband practices his cast on the Skykomish River just outside of Gold Bar, WA. Fishing licenses are cheap: $22 for a year. Even if you don’t catch anything, nothing beats standing in a nice cool river with a beer. For quite some time I’ve been meaning to go up to Edmonds and catch the ferry over to Kingston; today’s heat finally inspired me to do so. When it’s hot out there are few places nicer to be than on a ferry crossing the Puget Sound. Puget Sound’s water is always beautiful and cool. The “Gateway to the Olympics” is lush and verdant. A mama seagull made a nice little home for her babies on a beam at the Kingston ferry terminal. You can look across the Sound and see Seattle. Downtown Kingston is quaintly charming and very small; it doesn’t take much time to walk all the way through it unless you stop to visit all the neat little stores they have there, of which there are quite a few. The Kingston Quilt Store had some amazing quilts; when it gets to be that time of year that I stop complaining about the heat because I’m cold, I’m definitely going to get some of their quilts to keep me warm. Before then I may go back to visit for their Saturday night concert series that runs through the month of August, the 2009 Tribal Canoe Journey or the First Annual Slug Hunt on August 8. Despite its small size, Kingston hosts a number of ice cream places; I found myself drawn into Mora Iced Creamery where they have small batch ice cream and sorbet made from fresh ingredients in flavors like Cinnamon, Spicy Chai, Goat Cheese with Fig, Cantaloupe and Pink Grapefruit. I had a scoop each of Lavender and Lemon Bar (made with bits of real lemon bar crust mixed in!) and can’t wait to go back and try more flavors. Kingston is definitely a fun place to visit. The ferry ride there and back is pleasant and the town is adorable. It’s well worth the trip.